via CrowdShare Sydney – a field experiment | CrowdShare Sydney. CrowdShare Sydney is an experiment in urban participation. We don’t really know what’s going to happen, but like all scientists we hope for the unexpected. Experimentation is about doing and reflecting. By sharing thoughts and deeds we hope to discover new territory together. Why is participation important? It’s important because we care about each other. It’s as simple as that. We care about others’ wellbeing, their happiness, and their purpose in life. Not everything’s about me. Nor is it simply about ‘us’. Participation is about everyone. It’s about young, old, rich, poor, left, right, green, atheist, religious, agnostic, local, international, immigrant, refugee. Our life here is everyone’s life. When we set out to design this program, we wanted to discern two frames to work within when considering participation in the future of our city. The first is the observation that digital isn’t staying. At least it will no longer be the focus. Like electricity, digital will become invisible. Our attention will be on network density. It won’t matter whether something is connected or not. The density of connectivity resulting in denser human relations will be important. How we are connected, the quality, and the agency of this connection is what will count. The second frame observes that that in the future you (aged under 26, studying at university) will be old. Yes you. Youthful exuberance often clouds a sense of transference—the knowing that what we make and do today is ours for tomorrow. So the question is to you: in 2031, when you’re at the height of your careers, families, investment, and you’re realising the impact of transference, do want to be undertaking urban participation like we do today? Do community forums attended by disgruntled retirees offer you hope for your city? 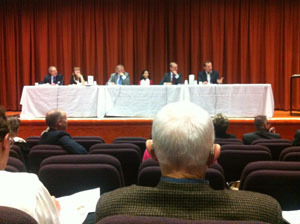 A forum organised by a community group to voice concerns about the proposed NSW planning legislation, 2013. City engagement should focus on more than feedback (which often descends into mutual contempt). The current approach assumes a lack of capacity of the community. Youth are barely engaged, let alone have some idea of how their future will be affected. Likewise, mass participation is assumed too arduous. We should be surprised that only 4000 submissions were received for the NSW planning White Paper. In a city of 4 to 6 million, what does 0.1% of the population’s feedback mean? To truly consider the future of our city, a far-reaching culture of participation must come first. This is the central motivation of CrowdShare Sydney. We need to recognise and support all kinds of active agency in the city. We should celebrate the diversity of ways people do things to collectively create their neighbourhoods, their communities, their networks, and their shared places. We need to elevate the small, local things that can grow to have greater impact. Surrounding this, fluency and skills to empower others are required. To start on this agenda, we need to turn around expectations of participation. Working towards making – not simply critiquing – our shared future is essential. It’s no coincidence that now, when we are more connected than ever, we are seeing a thriving trend in participation. The web is not taking us away form each other. Both online and face-to-face interactions are on the rise. For example, the Meetup and Open IDEO platforms enable this digital-physical blend on a massive scale. Meetup has instigated 111 million face-to-face interactions around the world. These are individual contributions to agendas, not simply social events. Meetup groups frequently collaborate to solve problems not being addressed by conventional mechanisms. Through this heightened activity, we are witnessing more awareness and diversity of participation in the public realm. The impact of this is not only one of breadth. There is also a case for sheer volume. Take, for example, the transformation of consumption and production. Conventionally, mass media, produced by a powerful few, attracted a large audience, who were primarily consumers. In comparison, in the current collective media paradigm, as enabled by web 2.0 social media and mobile technologies, there is a greater volume of both consumption and production. Those creating content are avid consumers of their peers’ contributions. 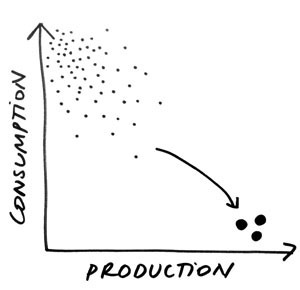 The diversity of production is greater, and the diversity of consumption is multiplied. In fact, a binary notion of consumption and production no longer applies. The interactions between players are complex. Often they are actively collaborating while being in competition. Influence is granular, but can also swell beyond its original authority. While the producers of mass media remain, the disaggregated crowd exists in an expanded state of high-production-meets-high-consumption. Resultantly, there is more detailed, diverse and articulated attention being paid to participation of all kinds. The relationship between production and consumption in a mass media paradigm. 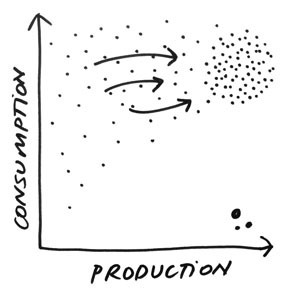 The relationship between production and consumption in a collective media paradigm. In this activated flattened field, citizens are more empowered than at any time in history. Not only are we able to edit, mash, publish, trade, monitor, enforce, crowdsource, and meet our future spouse at the swipe of a finger tip, we can create things in ways never before possible. Creativity bestows a seductive power. Conventionally, ways of making were passed on from master to apprentice. In the open source culture of the web, creators leverage this seductiveness to engage and educate new audiences in making practices. Increasingly, this online movement is shifting from a focus on coding to ‘making real stuff.’ The tactical urbanism and maker economy movements exemplify this object-based connectivity. As ‘makers’ they are not interested in individual objects isolation, but in their collaborative agency. Members donate unlimited energy to uploading evidence and sharing knowledge about the making of their physical things. Collectively, these objects have a network effect beyond their mere physicality. In this context, traditional institutions are struggling to understand how to interact with an empowered constituency. One example is the story of the TripView app, which was created at a weekend hackathon in Sydney. By hacking the database of transport timetables, its creators brought Sydney’s complex public transport offerings to users in real time. RailCorp threatened legal action, even though they offered no equivalent service to commuters, and then withdrew. Increasingly, the empowered crowd is creating the services we usually expect from the public service. Corruption is seen by many as a characterising feature of our city’s largest stakeholders – government and business alike. A digitally expanded, creativity-driven approach to city participation does not distract from the need to address this properly. The distribution of influence, if not power, to a broader audience might aid greater transparency. Activation of citizen attention towards city participation of all kinds aims to increase mutual responsibility and discourse. In this redefined hierarchy, everyone is a leader. In fact, traditional leaders need to lead by observation and empathy. We no longer want to hear about statistics and mission statements. Stories grab our hearts. We want meaning. We want our actions to have perceivable impact on a real person’s life, if not our own. We don’t expect to have bold and courageous decisions from the top. We demand ways to enable bold and courageous action from amidst the field to better shape decisions that affect us all. Governing agencies will increasingly compete with commercial entities that can offer meaningful urban participation in a seamless way. If we think about the opportunities described here, a greater sense of ownership and agency in the city is possible. Collaborative tools of making, rather than critiquing, can empower new solutions to specific issues. Creativity can become a tool of action that seeps into every part of society. The number one skill we’ll need won’t be a skill. It will be an attitude: “Let’s just try it and see.” By working iteratively and collaboratively, we can evolve an approach to creating our city that is inclusive. By recognising that different needs arise in different contexts we can interact appropriately and with relevance. This is not an agenda to exacerbate the digital haves and have-nots, or to further separate the savvy and the disconnected. It’s about people reaching out to each other and giving a damn. It’s about using the tools at their fingertips to share and inspire. This is why we have established CrowdShare Sydney. When we looked at the phenomena described here, we came to two realisations. First. The detailed disaggregation of attention based on passion rather than necessity creates focussed impact. In effect, we can do more when we know we want to—and better still, when we know we’d love to. Second. We are no longer interested in designing participation. Even this dictates too much. Our job is to curate attention and flow. Once we have gathered the deep, concerned and humble attention of our ‘crowd’, we can work together to achieve great things. To get started, we set up the ten-part CrowdShare Sydney panel to talk about these concepts with a range of activators and audiences. We set out a platform for actions in the city. These are bottom-up explorations of participation that you, me—anyone—can be involved in. In curating this field, we open the invitation to you: Your task is to activate and interact with your crowd in your own custom way. Our task is to humbly follow you. Posted on August 15, 2013 by Jochen Schweitzer. This entry was posted in u.lab. Bookmark the permalink.